Applicants should check their account at medmj.ehawaii.gov WEEKLY for registration status updates. Schedule an appointment with your physician/APRN. Go to https://login.ehawaii.gov and create an account. Remember your username and password. View Instructions Overview video of the application process. Direct withdrawal from a savings or checking account. Submit your application to your physician/APRN. Physician/APRN certifies your condition and submits your application to DOH. 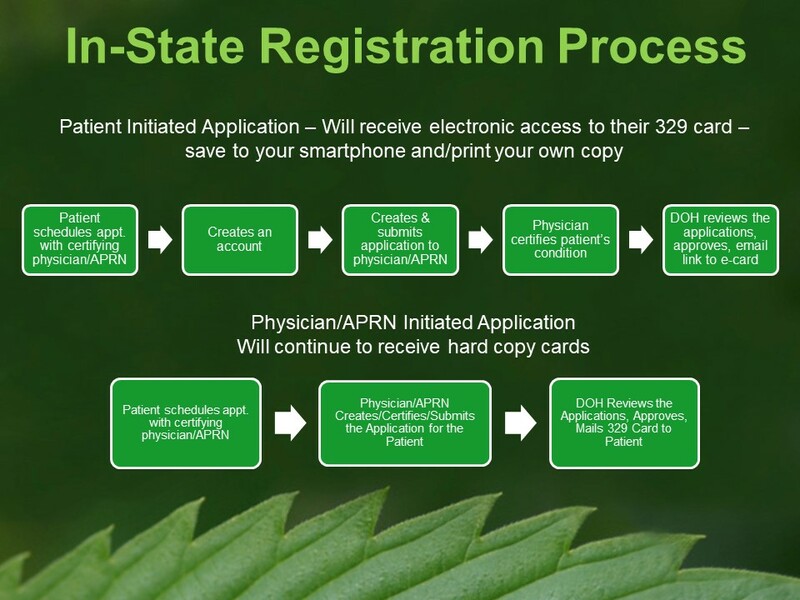 Please be advised that patients and caregivers are not authorized for the medical use of cannabis until such time that they receive their 329 card registration card in hand from the Department of Health, Medical Cannabis Program and they must keep both their valid ID and valid 329 card on them whenever they are in possession of medical cannabis. Not having data or WiFi to access your card electronically is not a valid excuse.